Video walls inspire the imagination of retailers, which is why more and more are integrating them into their retail outlets. They punch up the “wow” factor, whether a company is looking to convey an image of cutting-edge technology or a retailer elevating its brand. 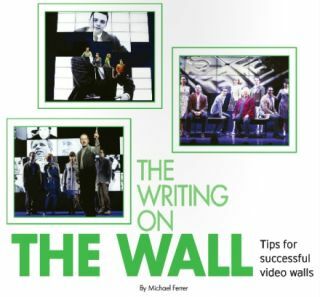 Video walls lend themselves to creativity. A perfect example of this is in the Diesel Store in Manhattan, where “digital mannequins” are on display, featuring products in a cutting-edge way. But that’s not the only place in New York where you can see them. Broadway is casting them as well. These digital mannequins can be found “interacting” with actors or forming bold backdrops, as in the Broadway production of “Sondheim on Sondheim” or the Plaza Theatre’s “Fabulous Palm Spring Follies,” respectively. That’s just one of the many examples of how these digital walls can be adjusted for the needs of the clients, no matter who those clients are. Bezels are shrinking yet continue to offer refined picture quality and higher resolutions. An 8x7 video wall in New York’s Viacom lobby is a perfect illustration. Content First. Before you do anything else, determine the number of images for display at one time. Content is critical. You must determine the types of content before the hardware is installed. You don’t want to be tweaking content on-the-fly minutes before a grand opening. Also, in what resolutions and formats will the content be designed? It’s imperative to have this conversation with the content creators up-front. Figure Out Your Needs and Goals. What are the goals for your video wall? What are its purpose, size and considerations? Will the video wall be used for branding, advertising, wayfinding or something else? Will it be interactive? If these questions can’t be answered with specifics, then a highly functioning video wall system will be difficult to design. And executives will not be happy after they have spent a lot of money on it. Go Native. Content needs to match the screens with native resolutions. All the hardware components should match so you don’t have bandwidth restrictions. Some graphics cards can’t handle full HD. You need experts involved to stretch Flash content with native resolutions, for example. Choose Professional-grade Products. Industrial-strength monitors can handle the most rugged of applications, while those sold at big-box retailers don’t run 24x7 and can’t handle commercial demands. Go with high-end products for their reliability, inputs and color calibration capabilities, and use displays that can be color calibrated to achieve brightness and color uniformity from screen to screen. Keep it Cool. Video walls can create a lot of heat. Cooling and ventilation need to be part of the overall project and budget, so purchasing displays that offer integrated cooling fans will ensure unfailing operation. Choose Appropriate Mounting Systems. Is the existing wall structure sound? Get a structural engineer involved to make sure that it can support a video wall. For the maintenance portion, ensure that you use pull-out mounts to service the video walls correctly and safely. Perform Color Calibration as Part of System Maintenance. Make sure you budget maintenance and cleaning of your video wall to ensure functionality and a great look for the long term. If you don’t vacuum vents, for example, the ensuing heat accumulation can destroy the monitors. Maintenance contracts should be discussed up front. Determine Electrical Requirements. Make sure you have thought through all the necessary components for the video wall system. If you’re deploying 15 screens, you can’t power them off of one outlet. You need dedicated power. In a hotel, you don’t want a microwave to shut down a video wall. Discuss power conditioners and surge protection with your systems integrator. Use Trained Professionals for Your Video Wall Installation. Do yourself a favor and connect with an experienced partner for the installation. That partner will help you locate power sources and data jacks and make sure you do the job correctly the first time. Michael Ferrer is a national manager of solutions sales and operations for NEC Display Solutions and a former systems integrator. He can be reached at mferrer@necdisplay.com.